We had much more enthusiasm for this event here at the Farmer's Market in Rapid City, SD compared to last year (which was our first). The automotive dealers were more involved and brought some new EV's, plus we had several individual owners, all of whom were quite enthusiastic about being able to personally share the benefits of their EV. We had a total of 9 plug-in EVs, including a Nissan Leaf, a Mitsubishi Outlander, a Chrysler Pacifica, a Prius, two Honda's (Clarity & Insight), two Volts, and a rare all electric Toyota RAV. A really cool thing was that we also set up a solar trailer near the cars to charge them! In addition, we worked with the Rapid City Sustainability Committee to host a follow-on event at the nearby Fairgrounds that included presentation about EV's and a panel discussion and a Q&A session that was attended by about 30 people. It was gratifying to learn about their efforts to get more charging stations installed throughout the city. 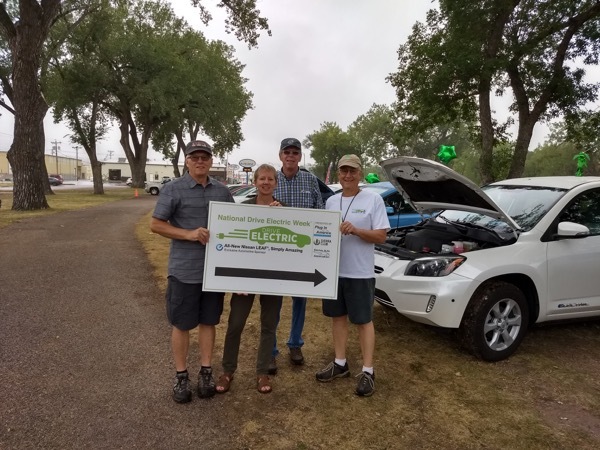 Shown in this picture are the main organizers of this EV event on 9/15/18 at the Farmer's Market in Rapid City SD, including (from L - R), Kelly Moore, Sherry & Fred Thusrten, and Rick Bell. In the background are some of the cars, including Sherry's rare all electric Toyota RAV just to the right! Come see several EV's, discuss their advantages with owners and what they like about them, plus there will be a solar trailer on-site that will be charging the cars and your cell phone too if needed! Event sponsored by the Black Hills Chapter of Dakota Rural Action, the Community Energy Development Committee, and Sierra Club. Registered attendees report 9,750 electric miles driven.